SINCE 2007 OVER 7 BILLION IN U.S. AND EUROPEAN AID HAVE GONE DOWN THE TUBES IN GAZA…….. – The Tundra Tabloids……. SINCE 2007 OVER 7 BILLION IN U.S. AND EUROPEAN AID HAVE GONE DOWN THE TUBES IN GAZA……..
Hamas and the Fattah expect the jizya to continue. Nothing to account for in the Gaza enclave, except for the luxury homes of top officials and their receipts to a myriad of off-shore banking accounts. Are They Going To Be Dumb Enough to Give More? The Palestinian Authority announced this week that it has spent nearly $7 billion on the Gaza Strip since 2007, when Hamas violently seized control of the regional coast. This means that since 2007, according to Fatah spokesman Ahmed Assaf, about $120 million has been going to the Gaza Strip. He revealed that the Palestinian Authority continues to pay salaries to some 80,000 “civil servants” in there– but he did not elaborate on the nature of their work. The West Bank’s Palestinian Authority government, headed by Salam Fayyad, has appealed to the donor countries to increase the financial aid to strengthen the Palestinian economy, especially in the Gaza Strip. 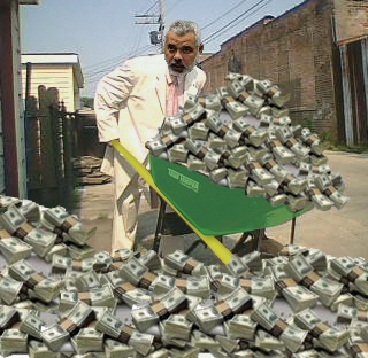 But before the donors take any decision, they really should ask Fayyad and Palestinian Authority President Mahmoud Abbas about the $7 billion they have already spent on the Hamas-controlled Gaza Strip over the past four years: Where is it? These revelations came on the eve of a meeting of donor countries in Brussels to discuss financial aid to the Palestinian Authority. The $7 billion that has been invested in the Gaza Strip by the Palestinian Authority has, ironically, helped Hamas solidify its control over the area. In other words, Fayyad and Abbas are funding their rivals in Hamas who terrorized them out of the Gaza Strip in June 2007. The Palestinian Authority is continuing to spend millions of dollars on the Gaza Strip at a time when its leaders are not even permitted to visit there; Mahmoud Abbas cannot even visit his home in Gaza. Previous Post Previous Post ILLEGAL MUSLIM MIGRANTS HURL ANTI-SEMITIC SLURS AT JEWISH SCHOOL IN BELGIUM……. Next Post Next Post FINLAND: MULTICULTI MIX-UP AS IMMIGRANT SCHOOL KIDS BEAT UP ETHNIC FINN IN COURTYARD…….. Donations to the belligerent ‘palestinians’ exceeds that spend by the West on the Marshall Plan. I figure it at $1.4bn and not 120m per year. And this is Gaza alone. But for politicians, this is not their money they are spending. Its ours and they can afford to be liberal with it.